KFC may have closed most of its stores in the UK but its birthplace is still open for business. Kevin Pilley took his arteries there. There were no members of the Buckethead Army changing the guard. I was the only tourist in the queue and the only one not wearing a tool belt, drill holster or nail and hammer pouch. Or hard hat. We stared up at the menu. As up at a landmark. 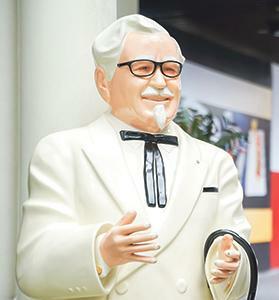 Colonel Harland Sanders’ statue in front of Kentucky Fried Chicken outlet. Building a pizza would have been a sacrilege. I had to have a bucket where it all began. The counter got closer as I scrutinised the world’s most famous bucket list. Kentucky’s best-known shrine has a strict dress code. In the ‘Bluegrass State’ a bib is best. Plenty of tissues are needed too. There are still thousands of Kentucky Fried Chicken ‘restaurants’ around the world. There are 4,000 in the US alone. But now, because of delivery problems – only a few open in the UK. But the one in Corbin, Kentucky is the most sacred. Its tables offering complimentary ketchup and sweeteners stand on hallowed ground. It is the birthplace of the ‘Finger Lickin’ Good’ culture. The cradle of fast food. The Colonel Harland Sanders Café at the Junction of US 25E and 25W (bus drivers eat free) is also a museum. It has a replica of the original 1940s motel room, dining room and open-kitchen where the Colonel invented his secret formula 11 herb and spice blend which he was convinced could separate a dull chicken from a sublime one. In cabinets are artefacts like 1950s napkins and napkin dispensers, posters, photos of signage, original honey stands and tubs, historic plastic cutlery, vintage condiments, antique chits and waitresses squiggle orders, cooking oil cans, original red and white gingham tablecloths and waitresses’ aprons. Everything is priceless. Except the now fading and very rare 1940s bills and receipts. You can have a selfie sitting with a statue of the Colonel or up against a weather vane which once called gourmands to come dine at the iconic fast food outlet, now on the National Register of Historic Places. Harland had a very strict gravy policy. He took his gravy as seriously as his poultry. And wanted KFC to stand for the highest quality gravy, so good “it’ll make you throw away the durn chicken and just stick to the gravy”. A restaurant once sued Sanders for libel after the Colonel complained that its gravy tasted like wallpaper paste. Midwifery was also on his menu. In the early days, KFC had no delivery problems. Volunteering for Roosevelt’s Works Progress Administration – a cornerstone of the New Deal effort to put Americans back to work after the Great Depression – Sanders ‘learned’ many men in the art of midwifery. Many of his regulars worked on the new road systems and had pregnant wives but no money for doctors. Colonel Sanders wasn’t a real military colonel. The title was honorifically conferred on him by the state Governor, Ruby Laffoon, for his services to gas. He later was re-colonel-ised for his charity work. And ‘food’. He operated the original KFC restaurant between 1940-1956. When he moved to Corbin in 1930 he pumped gas at the Shell service station opposite. There he shot fellow garage owner Matt Stewart who painted over his sign. Stewart shot and killed a Shell manager and got 18 years. Charges against Sanders were dropped. 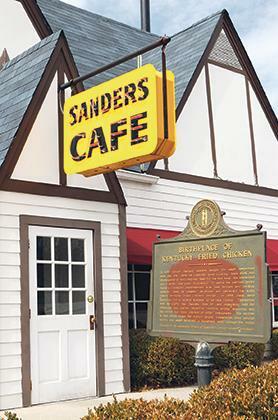 In 1937 he opened Sanders Café, seating 142. At his garage, he had started serving meals on his own dining room table – pan-fried chicken, country ham, string beans, okra, hot biscuits. In 1939, the café burnt down. He rebuilt it as a motel catering to increasing traffic along the busy north-south route. Then a bypass was built and in 1956 Sanders had to sell up. Following the idea of the Singer Sewing Co, he began selling franchises for his unique sauce and pioneering super-fast chicken-frying technique. This KFC franchise remained in operation until 1988. The café reopened in 1990. Those who visit Corbin do so to revere a food genius. And one of the most recognisable faces in America. Perhaps the world. The white hair, white tache and goatee, white suit, black string tie and black shoes made him a brand ambassador for chicken without having to wear a chicken’s head and outsized chicken feet. The Colonel is the only chicken tycoon to be lie in state after his death in 1980 at the age of 90. His body lay in the rotunda of the State Capitol in Frankfort. The Colonel was buried in his signature ‘look’ in Louisville’s Cave Hill Cemetery. The company he had sold for $2m in 1974 then boasted 6,000 outlets in 48 countries with annual sales worth $2bn. He also lost a lot of money trying to open an airport at Corbin. Sanders was a workaholic believing “Work don’t hurt nobody, work is wonderful for you. You’ll rust out quicker ’n you’ll wear out.” Before he arrived in Corbin at the age of 50, he had worked in a tomato cannery in his home town of Henryville, Indiana, a streetcar conductor, served in the Army, been a teamster in Cuba, a railroad firemen “doodlin’ ashes”, an insurance salesman, a JP in Little Rock, Arkansas having studied law by correspondence, operated steamboat ferry between Jeffersonville, Indiana and Louisville, sold tyres and acetylene lighting systems for farmers in Columbus, Ohio. It was in Corbin he had his electric bulb Eureka moment. Pan frying was too slow. And wasteful. The alternative was French-frying, immersing the chicken in a wire basket in deep fat. This was faster but the results were poor. In 1939, the Colonel decides to pressure cook his chickens to seal in the flavour and moisture. Fat filtration systems would further ensure quality control. It would take 10 minutes from table-to-kitchen-to-plate. Fast food in North America was born. Ahead of his time, the Colonel was 10 years older than Ray Krok who founded McDonald’s in the 1940s in San Bernardino, California. Pizza Hut started in Wichita, Kansas, in 1958, Waffle House in Georgia in 1955, Burger King (1953), Taco Belle (1962) and Wendy’s (1969). 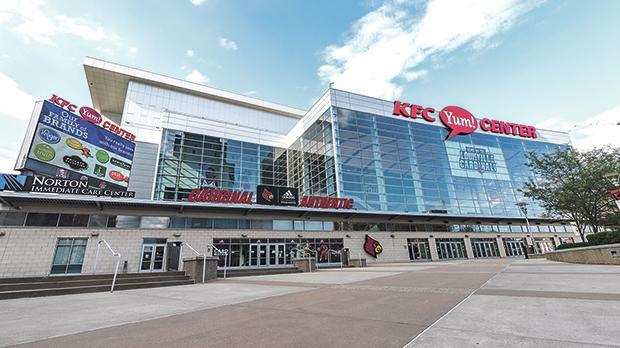 There is a KFC University in Louisville offering courses in chicken-frying, gravy-making equipment care, soft wheat ‘Pelster’ flour and giving tender, loving care to your shortening. But obstetrics is not on the curriculum.